Baby Gorilla. "Forest Treasure". 750 pieces. New in sealed bag - box has been opened. Puzzle Spirit Of Flight Factory Sealed. Trending at C $20.47eBay determines this price through a machine-learned model of the product's sale prices within the last 90 days. New, factory sealed puzzle. 750 fully interlocking pieces. Condition is New. Sealed and New. The pieces look to be in good condition. The box has a bit of light wear. 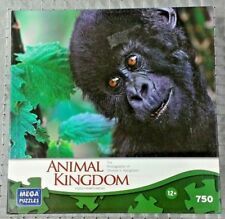 750 Piece Puzzle Baby Gorilla. O'Shea's, County Kerry. 18 15/16" x 26.75" Fully Interlocking Pieces. NOTE: The quarter in the pictures is for scale. Factory Sealed Puzzle. Pictures are of the actual puzzle you will receive. 750 Pieces. Garden Delights Spring Arrivals 750 piece jigsaw puzzle.